NEW YORK, New York — Within the framework of the Hayastan All-Armenian Fund Board of Trustees annual meeting, held in Yerevan, a delegation led by Executive Director Ara Vardanyan and comprising benefactors, trustees, and representatives of affiliates worldwide has begun a string of project reporting visits in Armenia and Artsakh. The delegation, which includes close to 40 members, has also started to hold opening ceremonies for recently completed projects. On May 23, the delegation officially unveiled two major infrastructure projects in the Martuni Region: the potable-water network of Karmir Shuka Village, and the Martuni Hospital. 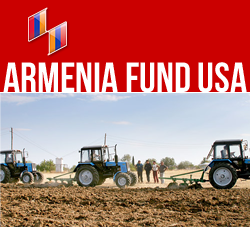 The construction of both projects was sponsored by Armenia Fund USA, US eastern region affiliate of Hayastan All-Armenian Fund. Dignitaries and guests participating in the opening ceremonies included Rev. Shahe Ananyan, representative of the Mother See of Holy Echmiadzin; Karen Shahramanyan, Urban Planning minister of NKR; Khoren Bandazian and Irina Lazarian, chairman and executive director, respectively, of the Fund’s US Eastern region affiliate; and local-community representatives. The festive events were attended by large numbers of local residents. A highly anticipated project since its start in 2011, the construction of the Martuni hospital was co-sponsored by the government of Artsakh, Armenia Fund USA, the Armenian Medical Fund USA, as well as by the late Giragos Vapurciyan, an individual donor from Detroit area who endowed the entire maternity ward of the hospital. In his opening remarks, Martuni mayor Mher Khachatryan spoke of the critical importance of the state-of-the-art facility. With a total area of 2,470 square meters and fully equipped to provide a broad range of health services, the Martuni Hospital is one of the largest establishments of its kind to be built by the Hayastan All-Armenian Fund. The two-story complex comprises a polyclinic, a maternity ward, an emergency room, an intensive-care unit, and departments of gynecology, diagnostics, surgery, and physical therapy. The hospital also features an advanced infectious-diseases department, with its own entrance. The hospital’s amenities include a large elevator, a boiler room, a power substation, and central heating and air-conditioning. The facility can serve close to 1,000 stationery and 1,400 ambulatory patients a year. The Martuni Hospital is the second major medical facility in Artsakh to be built through the support of the Armenian community of the Eastern US. The first was the Stepanakert Polyclinic, a landmark complex which was built in 2006. The 270 households of Karmir Shuka, comprising 1,050 residents, now enjoy around-the-clock access to potable water, which reaches them from area springs thanks to the recently built distribution network. The network, whose construction was co-sponsored by the government of NKR, includes an 11-kilometer pipeline and two regulation reservoirs.